Poor Andrea, reduced to yelling and disrupting meetings and conversations like a toddler. But she has her marching orders to keep fakes news in the headlines as long as possible. She should be banned from further participation until she can act figure out how to like a professional. 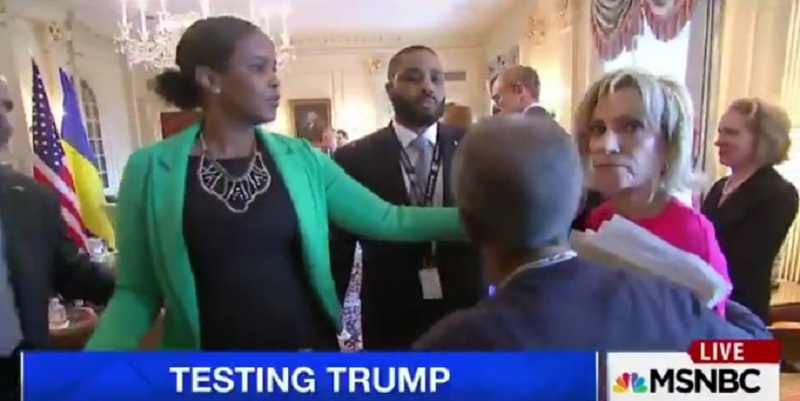 Cameras captured the moment that MSNBC journalist Andrea Mitchell was escorted out of a meeting between U.S. State Secretary Rex Tillerson and the Foreign Minister for Ukraine. Mitchell was yelling questions about Russia and Vladimir Putin Tuesday when she was hurried out.